Objectives: This work package involves all partners and will be devoted to the scientific, technical and administrative management of the Consortium to ensure its best development and positive achievements of its objectives. Partner 1 as the project coordinator, will lead this work package dedicated to the general management of the project including (i) resources and research management, (ii) reporting about the project development and generated data, (iii) knowledge management and Consortium agreement, and (iv) communication within the consortium. The scientific and administrative management will respect the decision making procedures and information flow chart to ensure monitoring of all collaborative activities towards the objectives of the project, project schedule, project implementation in agreement with administrative, financial, legal issues and delivery dates. The decision making structure will be constituted by the Project coordinator and all WP and task leaders. WP1-T1: Research management - Research results and progresses towards objectives will be monitored, gathered and assessed all along the project. The correctness of collaborative and exchange activities, as well as the respective contribution of partners, will be checked. WP1-T3: Reporting - This WP will be in charge of collecting, managing and exploiting the intermediate scientific reports that will be regularly provided by partners. The scientific output and progress of the project will be annually described in a report that will be sent to task leaders. Such a centralised management must ensure the right follow-up of the project progress. consumption of the partners will be monitored. The different work package leaders, as direct intermediates between the teams involved in the different aspects of the project, will regularly communicate with the Project Coordinator any problems encountered by the laboratories under their responsibility. WP1-T5: Communication within the consortium - Regular meetings via visioconference will be organised and frequent information will be provided to all members of the project through a website and partners’ forum dedicated to the project. These tools mainly in open access will be set up at the beginning of the project and regularly updated. This will ensure transparent and real-time information concerning the state of progress and also the main results issued from the different phases of the project. A large part of the data will be capitalized using the existing softwares “Cantharella” and “ECIMAR” opened and managed by IRD partner P1 and P6&7 respectively, using a dedicated database for the project needs. Additional GIS client/server organization will be provided for monitoring purpose. Leader: Mehdi Adjeroud, partner 1/IRD. distribution of the known species has never been assessed at a large scale. Moreover, spatiotemporal variability and effects of algal proliferations and the identity of the benthic organisms most affected by these events remain poorly documented. In order to fill these gaps we envisage an extensive mapping of knowledge within the frame of WP2 which will be set up in 8 areas including different tropical and subtropical Outermost Regions and Overseas Countries and Territories of Europe throughout the Pacific, Indian and Atlantic Ocean (see figure hereafter). In WP2, the actual extent of Asparagopsis distribution in the different areas, the large scale sampling for an integrated taxonomic approach (WP3), the qualitative assessment of its biomass and percentage cover, the identification of the benthic organisms (cnidarians in particular) affected by its proliferation, and its dynamic in space and time will be undertaken for the first time within the frame of a uniform sampling plan using standardised methodologies at multiple spatial scales. At each area different sites will be surveyed, the habitat and environmental conditions described, the depth distribution, abundance, and interactions of Asparagopsis recorded, and the algae sampled. At selected sites (4 sites in New Caledonia, 4 in French Polynesia, 3 in Reunion, 2 in the French Mediterranean, 2 in mainland Portugal, 2 in Madeira, 2 in the Azores, 5 in Guadalupe) a quantitative assessment of the genus percentage cover and cnidarian interactions will be then performed using standard non destructive sampling techniques (transects, video and photography). At each site three stations will be studied, and at each station three depth ranges sampled. The temporal variability of algal proliferations will be followed at the depth range, among those examined, where most algal-coral interactions are recorded. Sampling will take place at three stations per site at selected sites (1 site in New Caledonia, 1 in French Polynesia, 1 in Reunion) using fixed plot techniques (permanent transects and photo-quadrats) three times per year. A schematic representation of the sampling plan for New Caledonia is provided as an example in the figure hereafter. The use of widely adopted methodologies will ensure not only unprecedented homogeneity within a dataset including tropical and sub-tropical areas, but also a compatibility with existing coral reef monitoring programmes (WP5). The main innovation of this WP resides in the geographic and temporal scale of the assessment with a uniform methodology and spanning from tropical to subtropical areas rather than in the sampling techniques, which are, as mentioned, standard methodologies. Given the widespread nature of cryptic diversity among marine species, and difficulties associated with the taxonomical identification of individuals, a DNA analysis is required to characterize the full species diversity. In addition, we will combine the genetic analysis with two approaches to better characterize the algae taxa and their variations, namely a global metabolomic approach and an assessment of the microbial community. The combination of these different scientific fields and methodology is still very rare in particular in marine systems (but see the work done by partners 6 and 7 on sponges (Ivanisevic et al., 2011). Thanks to this combined approach, we can better examine the relationship between the proliferation/invasive status and the taxonomic identity of the overgrowing macro-algae. For the three approaches, we will study specimens collected in all the sites monitored in WP2 (tropical and subtropical Outermost Regions and Overseas Countries and Territories of Europe: Guadeloupe archipelago, La Réunion, New Caledonia and French Polynesia, Azores and Madeira archipelagos). Additional collections will be made in several sites in other regions of interest for sake of comparisons, in particular along the Portuguese coasts and the Mediterranean Sea where Asparagopsis spp. are well-established either naturally or following introductions and had been extensively studied in the past (see for instance genetic work by Andreakis and colleagues; unpublished observations from the partnership). The data gathered from the three approaches will be integrated in a common database. The DNA fingerprinting and genetic study of the alga will be carried out using a phylogeographic framework over a very large geographic scale (Southern hemisphere with Indian Ocean and Southern Pacific and Northern hemisphere in the Atlantic) including regions that had never been previously studied for this purpose (e.g. New Caledonia). This study will therefore bring a considerable amount of information to further understand the biogeography of these taxa and will shed new lights about previous studies carried out in areas where the species are known to have been introduced (e.g. Mediterranean Sea for A. taxiformis and A. armata and North East Atlantic for A. armata). Because of the presence of cryptic species that are not distinguishable based on morphological criteria, we will use a molecular approach already tested in the targeted taxa and data will be analyzed using a phylogeographic framework using 30-40 specimens per site. Network analyses, Analyses of Molecular Variance, Bayesian clustering analyses will be carried out over the whole dataset. The molecular work will be done through sequencing using one nuclear marker and one mitochondrial marker to test for congruence between the different genomes and avoid using only mitochondrial sequences that may be biased due to their haploid and non-recombining nature (Galtier et al., 2009). Markers selected (LSU rDNA, Scholin et al., 1994; com. pers N. Andreakis and the mitochondrial cytochrome oxidase subunit 2-subunit 3 spacer; Zucarello et al., 1999) were used in previous studies of Asparagopsis sp (Andreakis et al., 2007 and Sherwood, 2008). They were shown to be variable at both population and taxa level and to clearly differentiate the four main genetic lineages identified up to now in A. taxiformis (Sherwood 2008). Sequences obtained in the course of the project could also be integrated in the Barcode of Life project/GenBank and serve a reference for future studies. The second approach is based on metabolomics analyses. Such approaches have proven to be useful to distinguish among individual signals and thus might serve in biomarker discovery, for the identification of new chemotaxonomic characters in systematics, or as indicators of short-term environmental changes in ecology studies (Fiehn, 2002; Wolfender et al., 2009). Their usefulness in Asparagopsis for such a purpose will be tested thanks to a fine comparison with the DNA approach described above (in particular using the same sites). These metabolomic data will further be correlated with microbial data in order to assess the contribution of the microbial community to the secondary metabolism of the entire macroorganism. Metabolomic studies will be undertaken focusing on the secondary metabolism of Asparagopsis and cnidarians. Fluctuations in the production of these small molecules have already been interpreted according to several criteria including environmental changes or the presence of aggressors. In this context we will develop a unified process encompassing a large array of secondary metabolites. Because Asparagopsis is known to produce a vast diversity of halogenated metabolites (Roussis, 2004), two distinct analytical protocols will be required to isolate both volatile and non-volantile compounds. Secondary metabolites will be characterized by usual natural products tools including NMR and mass spectrometry. A database of Asparagopsis secondary metabolites will then be built with chromatographic indexes and structural data such as mass or UV enabling quantification of a majority of compounds by GC and HPLC-MS. A global approach considering non volatile and volatile compounds will allow to surveying fluctuations of the entire secondary metabolome. Comparison of the chemical fingerprints will require statistical analyses on the chromatographic data and will be applied to all individuals to evidence the chemotaxonomic markers of the different species of Asparagopsis. Concerning the microbial community study, advances in DNA-based techniques are revolutionizing and increasing the knowledge about host with all its associated symbionts (mainly microbes). Bacterial communities have been shown to be host species-specific (Rohwer et al., 2002; Frias-Lopez et al., 2002; Ritchie & Smith, 1997), but vary in some cases according to the geographic area, depth, or seasonally (Penn et al., 2006; Gast et al. 1998; Chiou et al., 2010; Brück et al., 2007). Evidence is accumulating that prokaryotes fulfill important functions for their host as they have been found to be involved in disease resistance/initiation, antifouling as well as nutrient fixation and cycling. Marine invasive species represent a serious threat to the world’s oceans. Symbiotic microbes can dramatically impact ecosystem function by changing the phenotype of their hosts (Gerardo et al., 2006). However, microbial communities within invasive marine species remain relatively unknown. Nugues et al. (2004) provided evidence that physical contact with the macroalgae Halimeda opuntia can trigger a virulent disease known as white plague type II that has caused widespread mortality in most Caribbean coral species. Colonies of the dominant coral Montastraea faveolata exposed to algal transplants developed the disease whereas unexposed colonies did not. The bacterium Aurantimonas coralicida, causative agent of the disease, was present on H. opuntia sampled close to, and away from diseased corals, indicating that the algae serves as a reservoir for this pathogen. So the spread of macroalgae on coral reefs could account for the elevated incidence of coral diseases over past decades and that reduction of macroalgal abundance could help control coral epizootics. We hypothesize that Asparagopsis could serve as a reservoir for cnidarians pathogens, and that the release of halogenic compounds could disrupt the healthy microbial community of cnidarians, could decrease its health and thus facilitate Asparagopsis invasion.To identify the core microbial symbionts of Asparagopsis sp and link variations therein to phylogenetic and metabolomic variations, a microbial community genomics approach will be used: samples from the same locations than those studied for genetics and metabolomics will be analyzed by new-generation sequencing the V6 region of the 16S DNA (with approximately 6000 sequences per sample and roughly 600000 sequences to be used for a DNA database). in cnidarian communities will be documented using some indicators of the algae natural toxicity and of the corals’ health. We will quantify the bioactivity as a proxy for the investment in production of biologically active substances (secondary metabolites), and we will relate this bioactivity to the different metabolic phenotypes in order to obtain a global picture (Biogeography level) of Asparagopsis bioactivity. Chemical defences may be particularly important in tropical environments because of the greater biodiversity and competition for space associated with tropical ecosystems (see for instance Paine 1966; Pianka 1966), but also because of different environmental conditions (e.g. temperature regime, light exposition). Thus, our first goal will be to compare the bioactivity of Asparagopsis from tropical, subtropical and temperate samples, and assess its natural variation over time in relation to the algae life cycle and some environmental factors (e.g. seawater temperature). Because there is ample evidence that secondary metabolites effectively deter predators, the secondary chemistry of Asparagopsis may also vary in response to the pressure of herbivores (see for instance Becerro et al. 2003). In the case WP3 demonstrates the existence of significantly distinct genotypes and/or cryptic species among Asparagopsis, we might particularly test the contribution of herbivores as a driving force in the evolution of the secondary metabolism. We will use the standardized Microtox® bioassay (Microbics, Carlsbad, CA, USA) which is highly repeatable and precise, allow quantification of the bioactivity of a large number of samples and can detect intra and inter-specific variation and community level patterns (e.g. Becerro et al. 1995; Marti et al. 2004). Furthermore, this bioassay correlates well with many other biological assays and natural fluctuations of the expression levels of targeted secondary metabolites (see for instance Botsford 2002 and Marti et al. 2003). In order to obtain the biogeography of Asparagopsis bioactivity, we will analyses algae crude extracts obtained from the metabolomic approach of the WP3. Furthermore, we will implement a spatial temporal monitoring of the bioactivity, in order to assess the baseline fluctuations of Asparagopsis bioactivity. Along their evolutionary path Cnidaria developed partnerships with a number of microorganisms. Their tight associations with prokaryotes and dinoflagellates (Symbiodinium spp.) are fundamental for the well fare of reef building cnidarians. Based on such tight associations the coral holobiont concept has been proposed. Indeed evidence is accumulating that prokaryotes fulfil important functions for their host as they have been found to be involved in disease resistance/initiation and antifouling. Bacterial communities have been shown to be host speciesspecific (Rohwer et al., 2002; Frias-Lopez et al., 2002; Ritchie and Smith 1997) and this specificity appears to be related with differences in genetics and nutritional status of the host, allowing different phylotypes in the same coral species (Kellogg et al., 2009). There is also a considerable variation in abundance and diversity between healthy and diseased corals, and the former’s usually are more diverse than latter’s (Chiou et al., 2010; Ducklow & Mitchell, 1979; Frias-Lopez et al., 2002; Pantos et al., 2003), what reflects that the holobiont is structured in the way that maximize the best its health (Rohwer et al., 2002; Reshef et al., 2006). The need to better understand how these assemblages are unbalanced/disrupted, causing diseases in corals, as well as the interest of pharmaceutical industries in the search for new antibiotics and drugs, are the main reasons for the increased effort in this type of research (Knowlton & Rohwer, 2003; Bull & Stach, 2007; Kim 1994; Kelman et al., 1998; Frias-Lopez et al., 2002). The knowledge acquired with the study of both symbiotic and opportunistic microorganisms, as well as the interactions between them and their hosts, is very important to better understand and prevent coral diseases around the world and to help maintaining their health (Rosenberg et al. 2007; Ritchie & Smith, 1997). (iii) metabolic fingerprints and bioactivity of corals (especially for octocorals in sub-tropical area). To verify the allelopathic nature of the seaweed-coral competition (as opposed to abrasion or shading), the field experiments will be complemented with in vitro incubations of coral species with different fractions (from the most hydrosoluble to the most hydrophobic group of compounds) or pure compounds isolated from Asparagopsis in WP3. Fish herbivore control of algalcoral interaction will be tested on “fished vs protected” areas or eventually using caging experiments, under various scenarios regarding the balance between algal and coral cover. We will use video records to perform a first inventory the herbivore fishes able to feed on Asparagopsis, and then, depending on their abundance, we will test the pressure they represent on selected “chemical defences” in Asparagopsis. Ecological bioassays will be also developed in aquarium in order to assess the putative effects of the chemical components of Asparagopsis on herbivores (Mollo et al., 2008). Disseminate the project and its’ findings and knowledge produced by research activities to scientists and non scientists. Active participation in key projects and programmes concerning marine monitoring and conservation, with relationships to Coastal Zone Management and study of the Global Change. 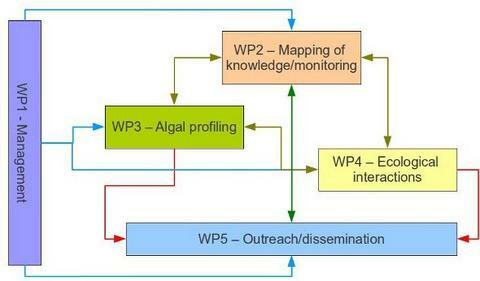 WP5-T1: Communication towards managers and stakeholders - As noxious invasion of Asparagopsis may have harmful effects to marine biodiversity and/or human activities depending on pristine coastal areas and proper zone management, there is a need to inform the maximum of concerned stakeholders. In addition to open seminars and outreach activities, executive summaries of the scientific results gathered in WP2/WP3/WP4 will be made available. A website dedicated to the project will be built which aim to provide a platform of data and documents for both scientists and non scientists. This will be developed in addition to usual scientific communications in journals, congresses, and meetings. Additionally a short documentary or set of videocasts on the project objectives and activities will be produced and made available. WP5-T2: Asparagopsis as an indicator for water quality/ecosystem monitoring - Developing adapted indicators for European overseas waters (tropical and temperate), especially (i) coastal waters and (ii) coral reefs is a key issue to achieve as part of the European Watershed Framework. Besides conventional parameters such as nutrients or coral cover, harmful/noxious algal species appeared to be interesting targets to monitor as part of long-term programmes. Moreover, due to climate change and more direct anthropogenic drivers, some consequences are attended on benthic communities, such as the increase of soft communities (including algae) replacing hard communities (cnidarians). WP5-T3: Production of a technical handbook on Asparagopsis management - A technical Guide (bilingual) will be one of the output products for each targeted region. ID cards of existing species, ecological and socio-economical impacts of invasions/proliferation, feasible and cost-efficient protocols to survey algal populations will complement the technical guide. It will also propose several management measures and procedures (identifying their benefits and limitations), in particular towards the eradication, proliferation control and on how to deal with and reduce established populations of invasive/exotic algae. This task will be fed by results from WP2 (present status), WP3 (ID and native vs. non-native status) and WP4 (ecological impacts).